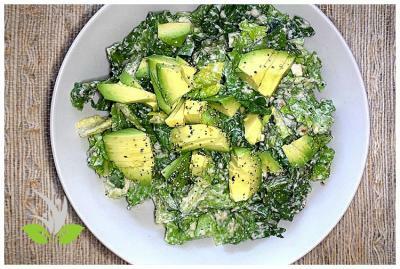 Greens should make up a big percentage of a balanced raw foods diet (or any diet!). 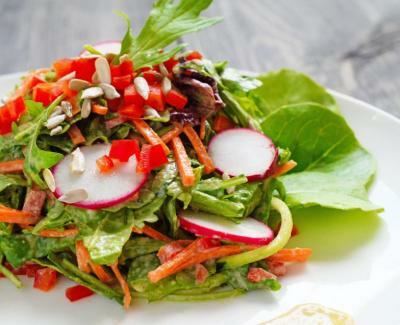 Browse through our curation of fresh salads and keep those taste buds happy! Get back to FRESH after the Thanksgiving festivities by enjoying a big, crisp salad today. 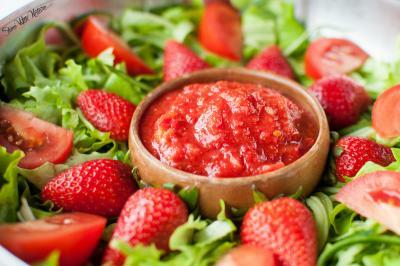 This salad dressing by Tiasha Slana of Shine with Nature is a wonderful blend of delicious tomatoes and fresh strawberries, which combined with a couple of other ingredients, make a really nice balance of sweet and salty. Enjoy! This is the most delicious way to get lots of capsicum into you. Just one capsicum (red bell pepper) contains 300% RDI of Vitamin C! 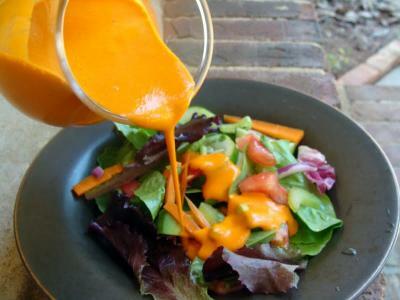 This Capsicum Trio Dressing by Amanda Brocket of The Raw Food Kitchen will delight your taste buds with its sweetness and creaminess. Get creative and try using it as a sauce for some zucchini noodles, or even as a soup. 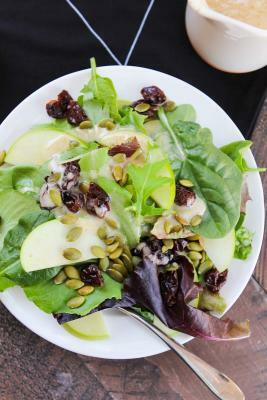 Tart apples and sweet cranberries pair with crisp lettuce, tangy dressing, and crunchy pepitas in this tasty, fall appropriate salad by Amber St. Peter of Fettle Vegan. This salad is packed with good-for-you ingredients and is a great starter before a meal or as a meal in itself. The end of summer can be a little bitter sweet. 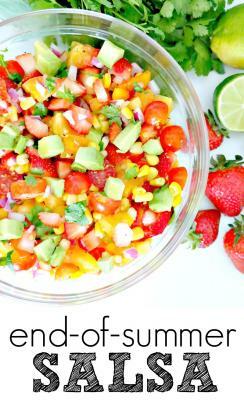 Or in the case of this End of Summer Salsa recipe: sweet, savory, and JUICY-good! Recipe by Shannon Leparski of The Glowing Fridge. 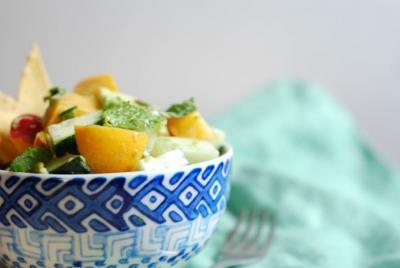 This summery salad by Hallie and Reya of Nibs and Greens is perfect as a light snack or part of your lunch/dinner. In addition to the crunchy vegetables and sweet nectarines, crispy pumpkin seeds are also added for a little iron and magnesium boost. And avocado, because no salad should be left without avo. The dressing is simply a squeeze of lime plus some chopped mint leaves to freshen things up. This salad is destined to become one of your new favorites! You will start craving your greens, as long as they're paired with this creamy raw vegan caesar dressing by Crystal Bonnet of Raw Revive. Feel free to add any of your favorite veggies, on this one I have added mushrooms, cucumbers and of course avocado. 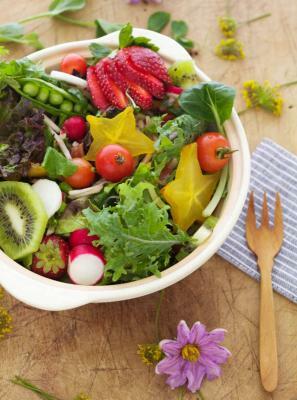 Add something utterly refreshing and delicious to your dinner spread tonight with this summertime salad with lemon tahini dressing by Crystal Bonnet of Raw Revive! 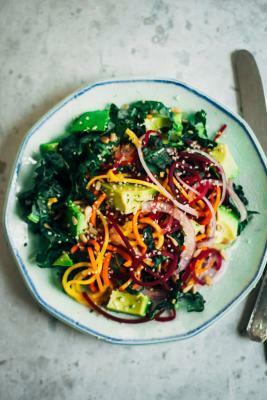 Enlighten all seven chakras with this gorgeously hued rainbow chakra salad by Sarah Aldrich of Well and Full, made with fresh vegetables and high vibes. 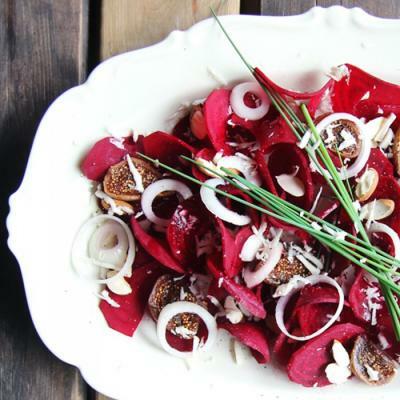 This delicious recipe by Christine Roseberry of Just Glowing with Health takes under ten minutes to prepare and is a great salad to make the night before and bring it to work with you the next day. 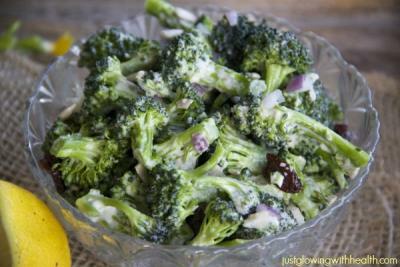 The extra time spent sitting will soften the broccoli and make it more flavorful. Enjoy as is, over a bed of spinach or arugula, or take a large cabbage or lettuce leaf and fill it with the broccoli salad and eat it as a wrap. Enjoy! This time of year brings with it many opportunities to indulge, which can be fun and all, but might leave you with some unpleasant physical after-effects. If this situation is happening to you, it's time to focus on the fresh, the raw, the green, and preferably the (very) simple. 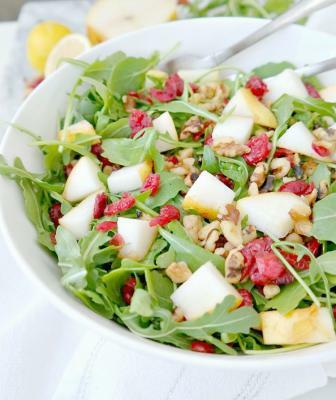 This delicious aurgula salad recipe by Shannon Leparski of The Glowing Fridge will put that healthy pep back in your step! 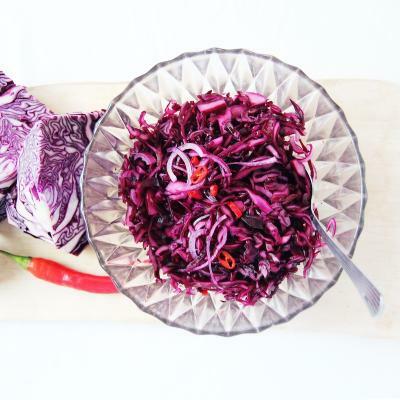 The loveliness of this side dish by Jenny Mustard will never cease to amaze you. While it's fresh, full of flavor, and satisfying all on its own, this salad also happens to be the perfect companion to a variety of different dishes. Try it paired with hummus and a slice of sprouted bread or raw crackers. Enjoy! A pizza salad is a classic dish in sweden, and very often accompanies a pizza from the pizzeria. In this recipe, Jenny Mustard recreates this Swedish favorite; it's actually so easy to make at home! Sometimes it's hard to find a salad recipe that is truly substantial enough to be the focal point of your meal, but this nourishing blend of ingredients by Gena Hemshaw of The Full Helping is just that. 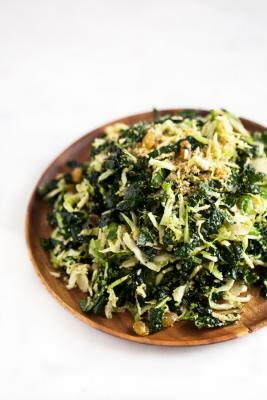 A raw shaved brussels sprout and kale salad with a delicious tangy-sweet maple dressing and and omega 3 and protein-rich hemp and pumpkin seed parmesan sprinkle. Enjoy! If you're under the impression that you can't enjoy cauliflower raw, you must not have tried it as tabbouleh! 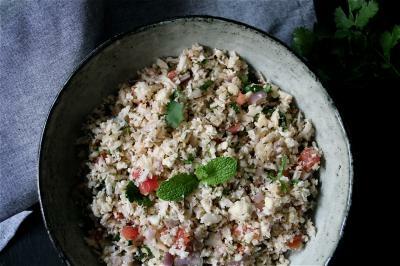 Cauliflower tabbouleh is an excellent version of a raw, light and healthy salad. The addition of chia seeds, hemp seeds, and gomashio instead of salt within this recipe by Petra of Oh My Delish gives an important upgrade to the nutritional value.